Ann Taylor LOFT. We have a large selection of clothing, shoes, belts and handbags. With over 2000 of the most desirable labels in our inventory, you’re bound to find lots of rare and hard to find pieces as well as common necessities. (To 1 1/2 in.). Product Line: Studio Upper Material: Leather. Occasion: Formal Style: Loafers & Slip Ons. Pattern: Solid Material: Leather. .SIZE: 9AA.Two different type of leather texture. MATERIALS: Genuine Leather. ~ Pricing does not have any bearing on quality or condition. Intimates and Sleepwear. Kate Spade. Special Details - Slip On, Very Minor Marks On Suede Upper, Minor Wear On Soles And Insoles, Very Good Condition. Material - Suede. We have a large selection of clothing, shoes, belts and handbags. You will be receiving the item you see in the pictures. It is not necessary to draw the outline of each toe; the longest toe is of primary concern. If between sizes, go to the next highest half size. Colors - Burgundy Red. We have a large selection of clothing, shoes, belts and handbags. With over 2000 of the most desirable labels in our inventory, you’re bound to find lots of rare and hard to find pieces as well as common necessities. Intimates and Sleepwear. Style - Slingback Heels. Kate Spade. This section will auto expand to fit your content. Material - Patent Leather. We have a large selection of clothing, shoes, belts and handbags. Stunning shoes. Soft nubuck leather upper! When you are finished, you can check out. 100% authentic! view the pics! Intimates and Sleepwear. Kate Spade. We have a large selection of clothing, shoes, belts and handbags. With over 2000 of the most desirable labels in our inventory, you’re bound to find lots of rare and hard to find pieces as well as common necessities. You will be receiving the item you see in the pictures. FERRAGAMO GOLD BUCKLE. IT HAS FERRAGAMO LOGO ON INSOLE. PERFECT HEELS FOR A BEAUTIFUL NIGHT. THE INSOLE AND OUTSOLE COLOR IS TAN. COLOR: WHITE. MADE IN ITALY. These shoes are in good used condition. Shoes are with a 1” heel. No tear or cracks in the leather. Whatever was stitched to the front of the foot has been removed. I will do my best to fix the problem if it was my mistake. Espadrille wedge for easy walking. I usually reply back right away. In GOOD condition [CHECK CHART BELOW] heel size 1/2". EXCELLENT CONDITION 80/100. GOOD CONDITION 50/100. USE CONDITION =40% of 100. condition of item. WHAT YOU SEE IS WHAT YOU GET. Material - Suede. Special Details - Slip On, Minor Wear On Soles And Insoles, Faint Wear On Suede, Very Good Condition. We have a large selection of clothing, shoes, belts and handbags. With over 2000 of the most desirable labels in our inventory, you’re bound to find lots of rare and hard to find pieces as well as common necessities. Intimates and Sleepwear. Style - Mules. Kate Spade. We have a large selection of clothing, shoes, belts and handbags. With over 2000 of the most desirable labels in our inventory, you’re bound to find lots of rare and hard to find pieces as well as common necessities. Signature bow. Color is BLACK. Size 5.5 AA. Size 7 AAA. The color is chocolate brown. Style:Varina Luxury Ballerina Flats with Vara Bow. Pictures are of the actual shoes. Color:Brown / Dark Tan. NEW in Box with defect condition. Reduced By 1/2. Making Way For New Inventory! Toe to heel inside length…. Toe to heel outside length…. Outside sole widest point…. Beautiful shoes! They are in very good condition. They show very minor scuffs and scratches as associated with normal wear. Intimates and Sleepwear. Kate Spade. Material - Suede. We have a large selection of clothing, shoes, belts and handbags. With over 2000 of the most desirable labels in our inventory, you’re bound to find lots of rare and hard to find pieces as well as common necessities. Intimates and Sleepwear. Kate Spade. Special Details - Excellent Condition, Faint Wear On Soles And Insoles, Faint Nick In Heels, No Flaws, Slip On. Size - 9 AA. We have a large selection of clothing, shoes, belts and handbags. Gorgeous Women's Salvatore Ferragamo Denim Loafers. Size 7 1-2 or 38 European size. Excellent condition and very comfortable! Color is BROWN CROC LEATHER. Size 6 3A. Made in Italy. Style: SQ 2318 D15 X.
Ann Taylor LOFT. Style - Closed Toe Heels. Material - Suede With Patent Leather Trim. We have a large selection of clothing, shoes, belts and handbags. With over 2000 of the most desirable labels in our inventory, you’re bound to find lots of rare and hard to find pieces as well as common necessities. Ferragamo shoes Gianni logo size 7b. Brand new Ferragamo woman’s sneakers with box, bag, dust bag and receipt! These are not being sold anywhere! Unworn classic style! The pictures are actual and will best describe the item; what you see is what you will receive. Pre-owned in good condition as shown in pictures, no box !! Made in Italy Brown Suede. Style # DQ 52812 B56RA. 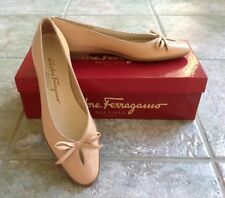 These lovely Salvatore Ferragamo size 6 1/2 shoes are in excellent condition. They are terrific and comfy and perfect for work or play. They are leather and sturdy microfiber uppers with non marking rubber bottoms. The top has a little Mary Jane like strap with a silver metal Ferragamo logo. Great shoes that you will want to wear again and again. Happy bidding. Payment is required within 2 days of the end of the auction. I have been burned and have had to start and enforce this policy. Thanks.